In 1998, I was one of six shops chosen to design a line of fabrics as a shop challenge. I won the challenge and designed over 10 collections for Kings Road Imports. I have designed over 50 different lines of quilting fabric for several fabric manufacturers. 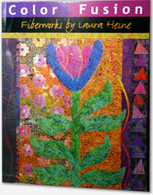 My book Color Fusion: Fiberworks by Laura Heine, published by Dragon Threads, shows my award winning quilting techniques, five of my original quilting patterns, and how I design my fabric line. I even included some inspirational stories on how I overcame my adversities through quilting. Currently, I am working in my Collage Quilt Collection and have designed over 50 different collage patterns. My book, Laura’s Little Book of Collage 2nd Edition is a complete color picture instruction book with step-by-step instructions on the floral and painterly techniques. I am traveling all over the United States teaching my technique and sharing the fun of ‘making’ with my students.